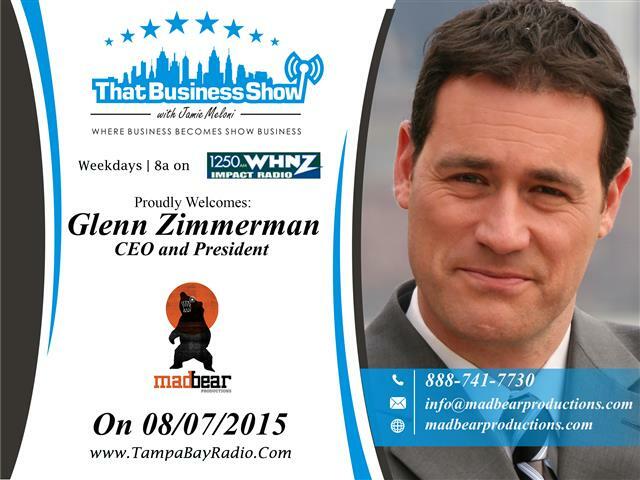 My opening guest on the program was Glenn Zimmerman, CEO and President of Mad Bear Productions where he harnesses the power of story to help business, non-profits and events engage with their target audience through video marketing. Glenn shifted directions in life after an award winning career as an award winning journalist with the #1 station in Detroit (WXYZ-TV) and with NBC’s flagship station in New York (WNBC-TV). Glenn and I share a great discussion on the shift in media focus which was one of his drivers in leaving the profession to focus on his venture at Mad Bear Productions. He, as do I, feels the media has focused away from information dissemination to a focus on ratings grabbing stories and partisan rhetoric. While he’s quick to point out that many members of the media do amazing work, he was left feeling that the industry’s focus as a whole was not where he felt it should be and elaborates on that in this opening. segment. The lovely Stella Giudicelli joins in on the discussion on the 2nd segment and discusses how she has given up TV as of 3 years ago and the shift it has made in her mental focus and career is very positive. She also describes the differences she sees in European based news programming versus the news in the United States. This is a great discussion and catch it On Demand on my YouTube Channel or http://www.tampabayradio.com, just click on Show Info for the replay, August 7th is the air date. To learn more about Glenn, check out his website at http://www.madbearproductions.com and email him at info@madbearproductions.com or phone at 888-741-7730 for more information! 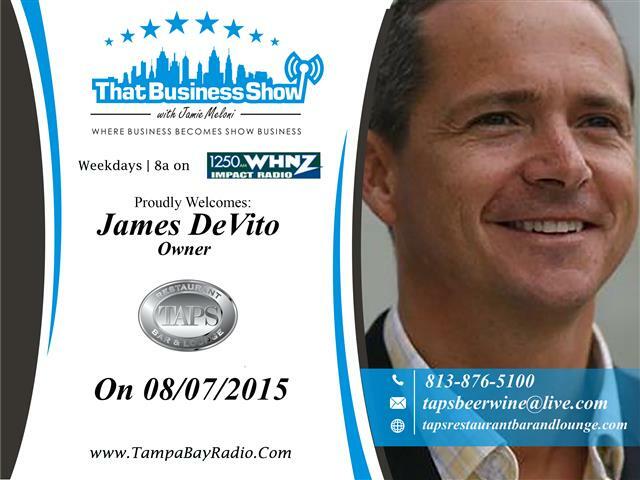 My 2nd guest on the program was James DeVito, Owner of TAPS Restaurant Bar and Lounge. James ventured into the restaurant business after 7 successful years on Wall Street and talks about this transition and how he started at the bottom and worked his way up to now owning 4 locations under the TAPS brand. He worked initially as a server and bartender to learn the restaurant business and worked his way up to a General Manager before entering culinary school to perfect his cooking skills. 3 years later, he opened his restaurant in downtown Tampa and 7 years later has 4 other locations. The downtown location is located in the SkyPoint Building at 777 N Ashley Drive and many people have probably been inside and didn’t even realize it given its great location downtown with easy access to the Straz Center and many buildings Downtown. Other locations are in International Plaza Mall in the Food Court, Winter Park Village outside of Orlando at 480 N Orlando Ave and Naples at 9108 Strada Place. James highly recommends the meatballs as his favorite dish in his restaurant but they have a variety of offerings including beer, wine and liquor and they are open to hosting events, just contact James for more information. Learn more at http://www.tapsrestaurantbarandlounge.com and James can be reached at 813-876-5100 or email at tapsbeerwine@live.com! This entry was posted in Entrepreneurship and Business and tagged branding, foreclosures, mad bear productions, real estate, shift in media, TAPS, taps restaurant, video marketing. Bookmark the permalink. ← Show Recap – Michael Murphy Art Gallery and #AmericanPlumber Gets Off The Chain with Topher Morrison!